Where: 15500 San Pasqual Valley Rd. Transport yourself to the savannah quicker than you can say “Look at that leaping lemur!” Sidle up to giraffes, rhinos, and antelopes on the Africa Tram. Track Sumatran tigers on the three-exhibit Tiger Trail. The Safari Park is about as wild as it gets—without the need to trek through the bush for days on end. 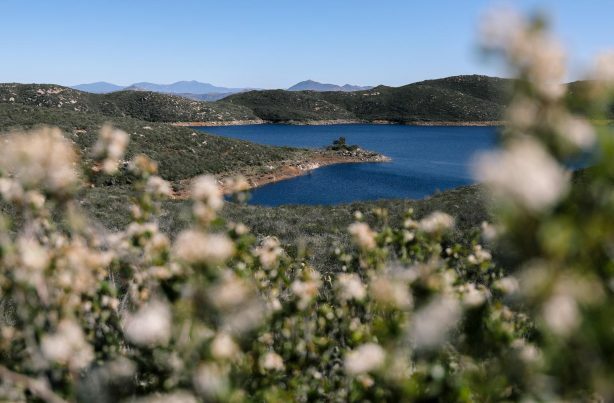 Hike, mountain bike or ride horses on 11 miles of trails through surprisingly lush, mountainous chaparral surrounding the 8-billion gallon Olivenhain Reservoir. The moderate, dog-friendly paths wind among wildflowers to six overlooks giving vistas of the Pacific Ocean, Channel Islands, and Laguna and San Bernardino mountains. The tree-lined Escondido Creek near the trailhead beckons as a shady respite to enjoy year-round flowing water (swimming prohibited). Follow the Way Up Trail for a more challenging 7-mile outing with rewarding views. Where: 340 N Escondido Blvd. A vast array of performing and visual arts has drawn more than a million visitors to this 12-acre campus. With a 1,500-seat concert hall, a 406-seat theater, an art museum, and dance studios, the very full calendar has something for everyone. You’ll find much more than bold IPAs on the gorgeous grounds of this brewery’s legendary headquarters. Environmentally-friendly landscaping surrounds Southern California’s largest brewery (tours available every day), gift shop, and restaurant. In addition to three dozen draft beers and numerous wines, the bistro offers a menu of elevated pub fare (vegetarian options available) made with many local and organic ingredients. Where: 136 S. Juniper St.
Get as close as you’d like to 200 rescued reptiles, amphibians, and arthropods, including a 17-foot python, a green anaconda, and an Asian water monitor. Kids and adults alike will learn a lot more than how the scales of a cuddly tegu lizard feel—they’ll get an education into threats plaguing these amazing creatures all over the world. Arrange a personal photoshoot with a few animal ambassadors to use as your next holiday card or gift. Where: 903 S Escondido Blvd. Long before doughnuts got trendy, this old-school shop was legendary among doughnut-lovers for its delicious, oversized, low-priced French Crullers ($.95), Bear Claws ($1.99), and Cinnamon Twists ($1.35). Even in the Golden Age of gourmet doughnuts in which we find ourselves, this nearly-four-decade-old institution stands out. There’s no reason a vacation can’t include some education at the same time. Inspire your children through exploration and experimentation at this hands-on museum. Science, arts, and world cultures are presented in imaginative exhibitions. There’s even a toddler tide pool to explore – and of course – get a bit wet. San Diego’s North County is a beautiful region of rolling hills and winding roads – and more importantly – a selection of world-class wineries. Expand your wine palate with these unique only-in-socal vineyards.